If you thought 2016 was MarTech’s year, just wait until 2017! 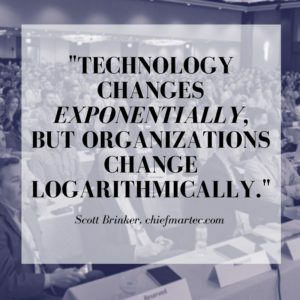 As we turn our eyes towards the new year and the next MarTech conference we have much to reflect on. The pace of change and adoption of marketing technologies continues to accelerate. And more than ever, marketing technology is playing a critical role in this time of massive upheaval and digital disruption. I thought it would be fun to wrap up this year with the top 5 highlights from our 2016 conferences to set the stage for what promises to be an incredible 2017. Number 5… Agile Organizations Take Flight. There’s a reason why the largest section of my book, Hacking Marketing, goes deep on adopting agile marketing — without an agile “management metabolism” in place, none of the other opportunities that marketing has to accelerate its innovation are possible. Number 4… Best of Breed is Big. Almost half of marketers (48%) have built best-of-breed marketing technology stacks made up of multiple point solutions, while only 21% use single-vendor suite. Dive in by downloading the latest State of Marketing Technology 2017 report from Walker Sands in our News section, which I was delighted to contribute to this year. Number 3… Adtech is a MarTech appetizer. Now is the time to reframe how you think about adtech. According to adtech icon Dave Morgan marketing is fast becomes a core competency for all organizations. Talk about a massive shift in perspective! Number 2… Marketing AI is (almost) here. Machine intelligence is already powering a number of key marketing technology applications — including “creative” tasks, such as writing copy and headlines, creating websites, and designing campaigns that most people don’t think a computer can do today. Number 1… Strategy matters more than ever. The key to fully leveraging a martech stack… strategy! When participants in the State of Marketing Technology 2017 study were asked “What would help you better leverage the full power of your current marketing technology stack?”, the answer “better stack integration” ranked 7th, near the bottom of the list. And yep, strategy was #1. Read my blog post on the study for more insights, data and takeaways. What will 2017 bring to the martech world? Change continues to be the only constant. Attending the MarTech Conference in either San Francisco or our recently announced Boston show is a great way to stay at the intersection of marketing and technology. If you’re passionate about how marketing technology is helping to reimagine customer experiences, then make sure to attend MarTech, May 9-11, 2017 in San Francisco, CA or October 2-4 in Boston…or both! Need to spend budget before the end of the year? Secure the lowest “alpha” rate for MarTech San Francisco today! Pay only $1,495 for an All Access Pass, $400 in savings compared to on-site rates. You’ll get the full MarTech experience: complete access to conference sessions, networking events including the Stackies Awards, marketing technology vendors in the Expo Hall, event mobile app, hot meals, WiFi and more!